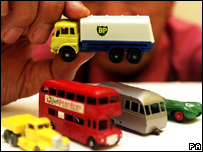 The co-founder of Matchbox Toys, Jack Odell, has died, aged 87. The engineer moved into the toy trade after joining a die-casting company that had moved into toy production. His daughter inspired the creation of his most famous invention in 1948 after her school only allowed her to take in an item that would fit into a matchbox. The miniature green and red road roller he developed for her to show off to friends became the forerunner of the Matchbox Toy empire. Among the firm's most famous designs was a miniature Coronation coach, made to commemorate Queen Elizabeth's succession to the throne, which sold about a million copies. Matchbox was floated on the Stock Exchange in 1960 and in 1968 Mr Odell and business partner Leslie Smith were awarded MBEs. Mr Smith died in May 2005, also aged 87. The business was reported to be selling more than one million cars a day in to more than 100 countries at its peak as low prices made them affordable to children. Matchbox items are still produced, though by US firm Mattel, after Matchbox Toys went into receivership in 1982. Mr Odell then established his own firm, buying some of the die-casting machinery from the receivers. He sold up in 1996 with another of Matchbox's rivals Corgi later buying the brand names and continuing to make some of the products. Some Matchbox items have become highly collectable. Its version of the Mercedes Benz 230S, bought for less than three shillings (15 pence) in 1968, was sold at auction in 1999 for £4,100.